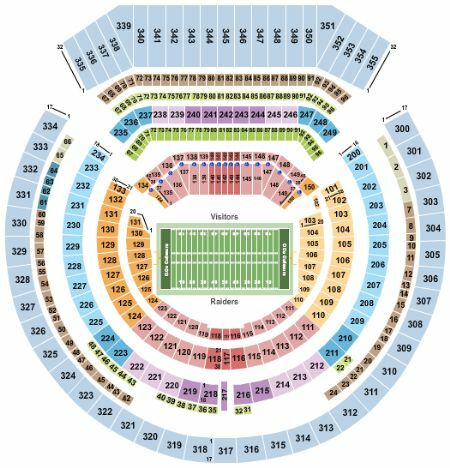 NFL Preseason: Oakland Raiders vs. Los Angeles Rams (Date: TBD) Tickets - 8/8/2019 - Oakland Coliseum in Oakland at Stub.com! Xfer Mobile Entry. Scan your tickets from your mobile phone for this event. Do not print these tickets Tickets will be ready for delivery by Aug 03, 2019. Mobile Entry Tickets. Must have smart device on hand to enter event. Do not print these tickets. Tickets will be ready for delivery by Aug 06, 2019. Mobile Entry Tickets. Must have smart device on hand to enter event. Do not print these tickets. Tickets will be ready for delivery by Aug 01, 2019. Tickets will be ready for delivery by Aug 28, 2019. Tickets will be ready for delivery by Jul 28, 2019. Mobile Entry Tickets. Must have smart device on hand to enter event. Do not print these tickets. Tickets will be ready for delivery by Jul 09, 2019. Mobile Entry Tickets. Must have smart device on hand to enter event. Do not print these tickets. Tickets will be ready for delivery by Aug 02, 2019. Mobile Entry Tickets. Must have smart device on hand to enter event. Do not print these tickets. Tickets will be ready for delivery by Aug 07, 2019. End zone seats. Xfer Mobile Entry. Scan your tickets from your mobile phone for this event. Do not print these tickets Tickets will be ready for delivery by Aug 04, 2019. Mobile Entry Tickets. Must have smart device on hand to enter event. Tickets will be ready for delivery by Aug 06, 2019. Corner end zone seats. Xfer Mobile Entry. Scan your tickets from your mobile phone for this event. Do not print these tickets Tickets will be ready for delivery by Aug 04, 2019. Aisle Seats. Tickets will be ready for delivery by Aug 04, 2019. Home teams side. Sideline seats between the 20 and 30 yard lines. Xfer Mobile Entry. Scan your tickets from your mobile phone for this event. Do not print these tickets Tickets will be ready for delivery by Aug 04, 2019. End zone seats. Second row in this section. Visiting teams side. Xfer Mobile Entry. Scan your tickets from your mobile phone for this event. Do not print these tickets Tickets will be ready for delivery by Aug 04, 2019. Fourth row in this section. Tickets will be ready for delivery by Aug 04, 2019. Mobile Entry Tickets. Must have smart device on hand to enter event. Do not print these tickets. Tickets will be ready for delivery by Jul 28, 2019. Home teams side. Sideline seats between the 40 yard lines. Xfer Mobile Entry. Scan your tickets from your mobile phone for this event. Do not print these tickets Tickets will be ready for delivery by Aug 04, 2019. Mobile Entry Tickets. Must have smart device on hand to enter event. Do not print these tickets. Limited view seating. Tickets will be ready for delivery by Aug 10, 2019. Sideline seats between the end line and the goal line. Visiting teams side. Xfer Mobile Entry. Scan your tickets from your mobile phone for this event. Do not print these tickets Tickets will be ready for delivery by Aug 04, 2019. Sideline seats between the 20 and 30 yard lines. Visiting teams side. Xfer Mobile Entry. Scan your tickets from your mobile phone for this event. Do not print these tickets Tickets will be ready for delivery by Aug 04, 2019. Does not include admission to event. Tickets will be ready for delivery by Aug 04, 2019. Mobile Entry Tickets. Must have smart device on hand to enter event. Do not print these tickets. Tickets will be ready for delivery by Jul 25, 2019. These seats are on the aisle with purchase of the entire group. XFER Mobile Entry. Scan your tickets from your mobile phone for this event. Do not print these tickets. Tickets will be ready for delivery by Aug 05, 2019. Home teams side. Sideline seats between the 30 and 40 yard lines. Xfer Mobile Entry. Scan your tickets from your mobile phone for this event. Do not print these tickets Tickets will be ready for delivery by Aug 04, 2019. Home teams side. Sideline seats between the 20 and 30 yard lines. Tickets will be ready for delivery by Aug 04, 2019. These seats are within 10 rows of the field. Tickets will be ready for delivery by Aug 07, 2019. Tickets will be ready for delivery by Jul 29, 2019. Mobile Entry Tickets. Must have smart device on hand to enter event. Do not print these tickets. Tickets will be ready for delivery by Jul 29, 2019. Home teams side. Sideline seats between the 20 and 30 yard lines. XFER Mobile Entry. Scan your tickets from your mobile phone for this event. Tickets will be ready for delivery by Aug 06, 2019. Home teams side. Sideline seats between the 40 yard lines. XFER Mobile Entry. Scan your tickets from your mobile phone for this event. Tickets will be ready for delivery by Aug 06, 2019.